Scientists continue to be baffled by the unprecedented number of dolphin standings occurring along Cape Cod Bay. One hundred and sixty beached animals have been counted since the mass-stranding began on Jan. 12. That's way above the annual average of 38 — and it's only February. Rescuers on Cape Cod have managed to save dozens of dolphins. But as this episode drags on, their resources are wearing thin. Everything about Wellfleet harbormaster Mike Flanagan screams longtime Cape Codder: his wind-worn features, his mental map of the harbor floor, and his rather unromantic views on the activity of saving dolphins. "Well it beats the alternative," Flanagan says, "pickin' them off the beach is not an easy thing to do." Wednesday morning, Flanagan is about a mile off Wellfleet, gently nudging three dolphins toward deeper water, using the vibrations of his boat to guide them through a labyrinth of points and shallow inlets. He calls this place a "fish trap." "The dolphins come swimming down from the north," he explains. "Once they get up in the harbor and the tide goes out on them, there's no place for them to go." From a rubber zodiac boat to Flanagan's port side, Katie Moore directs the rescue operation. She's the manager of marine mammal rescue and research for IFAW, the International Fund for Animal Welfare. IFAW has gotten a lot of press recently for dramatic and daring rescues of beached dolphins, but in between comes the long, tedious work of stranding-prevention — endlessly monitoring the shoreline and chasing away animals that get too close. As she climbs back on the dock in Wellfleet Harbor, Moore's drawn, pink face pokes out from under a salt-stained hoodie. Her eyes bug with the weary yet intense look of someone running on coffee and little else. She and her team of five other rescuers and researchers have been doing this 16 hours a day, seven days a week, for almost a month. "We know that we've had mass-strandings here on the Cape for hundreds of years, pre-dating the industrialized ocean that we've created in terms of noise and things like that," Moore says. "But this is an outrageous number of animals to be coming in." "One, certainly, is that as humans we have some affinity for marine mammal species, and people want you to save them. If we're not out here doing it, you know, we've had instances where the general public has put themselves in harm's way to try and help individual animals." Moore also argues that, even if these strandings turn out to be natural, humans have so disrupted the ocean environment — and presumably killed dolphins elsewhere — that we might as well save these animals because we can. "The other piece of it for us is also the science," Moore adds. "This is an opportunity to learn about species that are very very difficult to study." 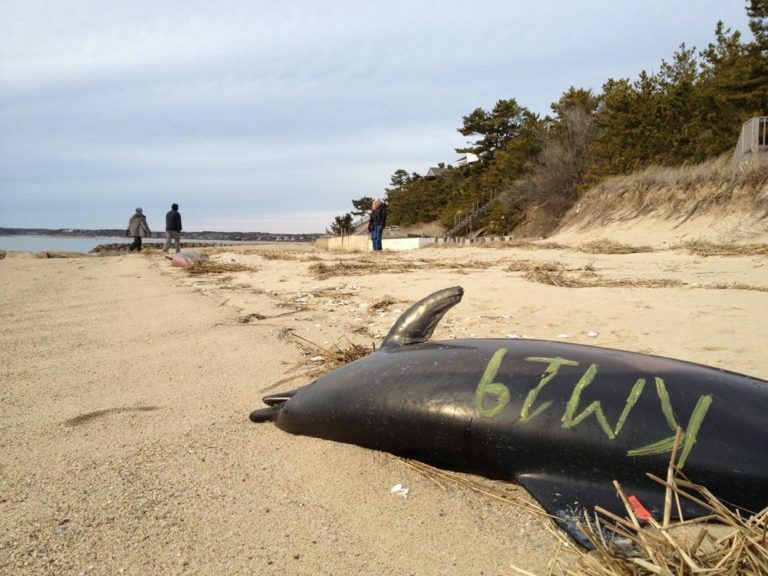 Indian Neck Beach in Wellfleet is littered with dead dolphins. It's pretty grim. Their skin is so smooth and shiny, they look fake — like pool toys left in the sand. They have yellow marking on their side, indicating that IFAW has already examined them. It's Wednesday afternoon, and IFAW is on the beach again because a volunteer spotted three live dolphins swimming too close to shore, and the tide is on its way out. The trio is, in fact, the same group from the morning. They didn't make it far before getting into trouble again. Moore is unfazed by this discouraging development. "I'm on autopilot and have been for awhile now, I think." The Sisyphean nature of her daily struggle doesn't bother Moore as much as the uncertainty of it all. Every day a dozen people ask her, "What is going on here?" On Day 28, she's no closer to an answer than on Day 1. "I feel like there must be a question we're not asking," she says. Moore offers possible explanations: "We know that the hook shape of the Cape is a big part of it, and these gently sloping beaches with the extreme tides. Part of it is the social nature of the animals, sticking together in groups." But none of that's new. What's different about this year? Disease? Warm weather? Secret military sonar? Moore says the Navy denies that last one. IFAW is collecting data that could point toward the answer but they literally can't stop saving dolphins long enough to analyze any of it. "So when does it end?" I ask. "I don't know," Moore says. "Every day we say, maybe this is the last day, maybe this is it. But amazingly this one just keeps going, so I honestly don't know and I'm frightened at the prospect of not knowing." Moore radios to her team out on the zodiac. They're trying again to lure the dolphins into deeper water. Moore is concerned they're losing light, because IFAW's boats aren't outfitted for nighttime navigation. The dolphins are hardly out of danger, but they have to pack it in. "There's not a lot more we can do," she says. The next day is a rare quiet one. Some IFAW staff catch up on paperwork at the office, others head out to patrol the shoreline, and then, a phone call. As the sun goes down, I meet Moore and some members of her team on Sandy Point Beach in Barnstable. In the back of a specially outfitted truck, two dolphins lay side-by-side, breathing audibly. "We had five animals reported back here in the marsh at Sandy Neck," Moore says, "two alive, three dead." A few miles west, the dolphins are wheeled off a beach near the Cape Cod Canal. Figures in dry-suits wade into the inky black. They take the dolphins to chest-level water, and let them go. "Uh, for the moment," Moore says. "The animals don't have the best shot. It was the best we could do, probably, for tonight. We prefer to put 'em on the Outer Cape." As Moore climbs back up the beach, she still has several hours of work ahead of her — tearing down the truck for the night and processing samples. In the morning, she'll be at it again. This weekend some people from the stranding network in New York are coming up to provide a couple days relief for her staff. It won't be a moment too soon. This program aired on February 10, 2012.